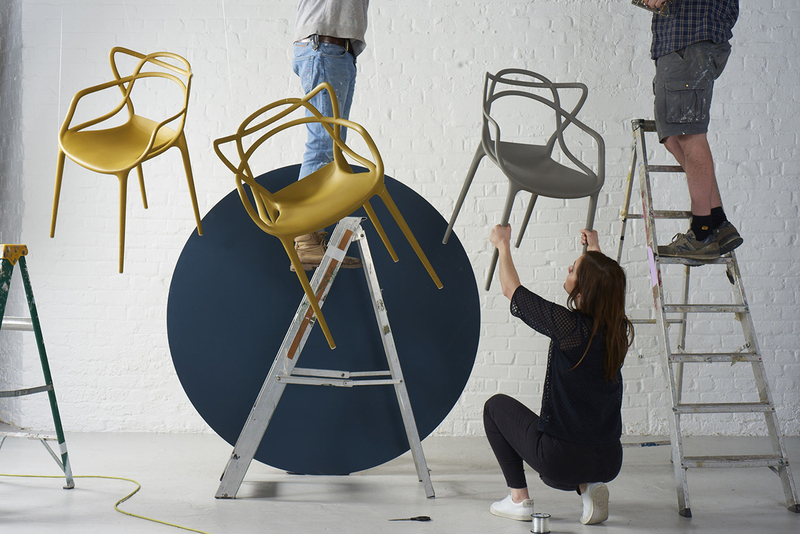 On a rather grey day in January, we headed to a light and bright studio in the heart of Dalston to shoot our latest campaign – Designs That Stick. We’re showcasing some of Heal’s most iconic pieces that have stood the test of time, both in terms of style and longevity. We teamed up with stylist Jo Bailey and photographer Andrew Boyd, to create a playful and creative campaign using the colourful adhesive tape from Japanese brand, Haru. The tape sticks to any surface, from walls to furniture, helping to inject colour and craft into any space. We chose six designs to feature as part of the campaign, including our Mistral sofa which has remained a favourite amongst Heal’s customers since its launch over a decade ago. Similarly, the Brunel Collection has been lauded for its blending of industrial and Scandi style, making it a versatile range perfect for homes short on space. Using a mixture of careful planning and trial and error, Jo and her team were able to pull together a series of shots highlighting the impeccable design of our most well-regarded pieces. Take a look below.